Cottage in beautiful and warm stone, with a total of 300 m2 (160m2 + 140m2 courtyard house), ideal for a resting holidays in summer or winter. Large living room with fireplace, living and dining area with Satellite TV with 70 channels, Internet access, DVD, video and traditional games. It has 3 bedrooms with stone on display and floor of polished wood. 2 of the bedrooms have double beds (1 in loft of 50m2 with living room) and 1 has 2 single beds. It has 2 bathrooms and fully equipped rustic kitchen. The patio has a garden with lots of plants and flowers, a small private pool, shower and barbecue, with complete privacy, being completely walled. It has a dining area with table and chairs and sun loungers. It has a beautiful view over the village and is very sunny from March to end October. 1 full bathroom with bath and no bidet, and another small toilet and sink only. For those who like to take shower outdoors on hot days, there is a shower in the courtyard. Villa with complete privacy and very quiet, a very quiet place but surrounded by many tourist, cultural and sporting interests throughout the year. It is located 70 km from Lisbon, 8 km from the sea, 8 km from Obidos, one of the 7 wonders of Portugal. Ideal to know the whole country, since it is located in the center. 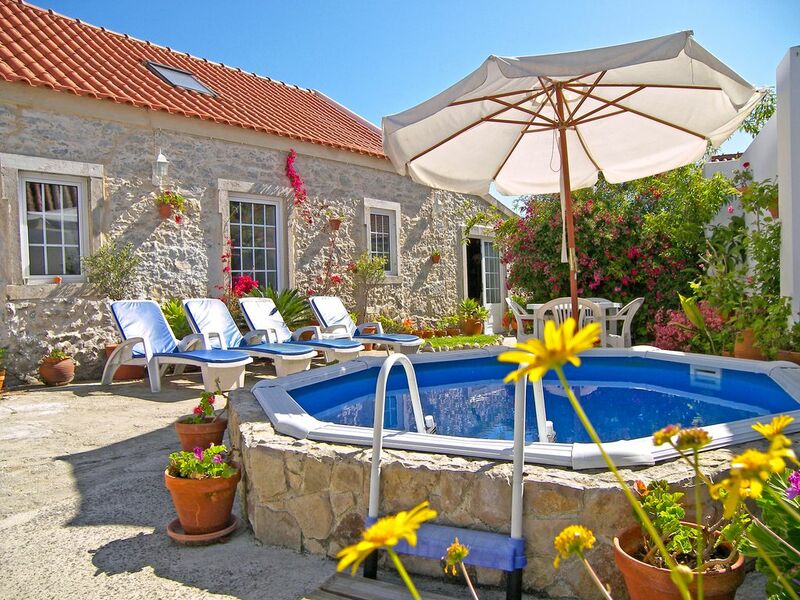 In summer it is ideal for those who want to sunbathe, from April to November, either in the courtyard (with pool and shower), whether at the beach. For those who like to spend a season in the winter, this house is very cozy and romantic, ideal for dinners by candlelight and the warmth of the fireplace. Come summer or winter, is always very welcome and the 'Secret Garden' is all yours. Everything was just perfect. Very nice people, very nice house. We did enjoy our stay at Secret Garden. The house is lovely renovated and furnished. It had all the equipement we needed during our stay. The only things in bathroom and kitchen is, that the windows could not be opened to get out the humidity and the smell of cooking fast. We always could contact the owners, which were very helpfull. The nearby beach in Lourinhã is very nice with good Cafés and Restaurants. We stayed at the lovely country-house of Rui and Mila for 6 weeks (Sept - Oct). "We" being myself, my wife our two little daughters and two dogs. The house offered pretty much all we could ever need and has a very personal and cosy touch to it. We had a wonderful time in Portugal. Rui and Mila were amazingly friendly and supportive with whatever question we had. Besides the house itself we enjoyed most the vast variety of beaches - all within a 30 minute drive. Also we visited Lisbon a couple of times (approx 1h drive), Sintra (1h), Coimbra (1,5h) and some other attractions. In the village there are two small supermarkets and a mercado for fresh vegetables, fruits and fish in walking distance. Larger supermarkets are at approx 20min driving distance. This rental property has a very homely feel to it which makes you think that the owners use it for holidays too. Rather than having that sterile empty feel that other rental properties have. It is very pretty inside and out with lots of additional touches to make it feel like a home. the location is difficult to find and we would not have found it with out the sat nav, so if you are not taking one ask for better directions. The owners are very helpful and will give you whatever advice you need. Although we live in the country in England. We were not quite prepared for the constant sound of barking dogs that apparently is usual in the country in Portugal. This was disturbing at night when we wanted to leave the windows open to catch the cool night breezes. In addition there were a lot of ants which chose to invade two of our daughters beds...this did not go down too well, but the owners did provide effective bug spray! Beautiful cottage set in a quiet village setting. The cottage is exactly as advertised on HomeAway. We were about an hour late arriving due to Lisbon rush hour traffic, but that was no problem for the owners Rui and Mila who met us at the cottage. They showed us around and where everything was and how it worked. There is a child's high chair and potty and numerous toys available. The kitchen appliances all work very well, and plenty of crockery and cutlery is supplied. We were kindly left a hamper on arrival including fresh fruit, olives, cheese and red wine. The 2 double rooms are spacious, especially the one upstairs which is huge and includes a tv and Nintendo Wii. The lounge/diner again is very spacious with room for 6 to dine. A tv is provided with satellite TV with channels in numerous languages. There is also a CD player and lots of DVD available. The Wifi also works well. The main bathroom has modern appliances comprising WC, basin, bathtub and shower. Hot water is plentiful! As noted in some other reviews, it would be useful if a head height shower head holder was fixed to the wall. The outside area is a great suntrap, and 4 sunloungers are provided along with 2 sets of dining tables and a brick barbecue. The pool is larger than it appears on the photographs and great for cooling off from the hot sunshine. There is space to park one car. The owners are always available if you have any questions or issues and speak excellent English. They have an assistant, Luis, who lives locally who is available at short notice if required. The village itself is very quiet. There are a few cafes which serve great coffee, cakes etc very cheaply. There is also a sports and social club which has a bar. There is a small indoor market selling fruits, vegetables and fish, there is also a butcher and a fishmonger. Additionally, there are 2 mini-supermarkets which sell pretty much anything you would need, and a bank with an ATM. You will also hear the church bells ringing out a tune every hour which our toddler son loved! There are a number of local towns with larger supermarkets within a 15 or 20 minute drive. There are lots of other attractions nearby including beaches, dinosaur museum, the wonderful Buddha Eden gardens and medieval town of Obidos. You can also reach Lisbon in about 1 hour mostly on motorways (the toll is 4.85€ each way). We found the property easily and the owners could not have been more friendly and helpful. We thoroughly recommend this cottage for a family holiday. Thank you for your big note about our house. It will be a big help for other guests. We've stayed for 8 days in this lovely and cosy house/home, with 2 adults and 2 children (2 and 3 years). They've slept like roses... and so did we! We received a warm welcome by the owners, who were available for every question. The house looks just like the photo's and has every comfort we needed (also good wifi, toys for the children, babybath/bed/chair/potty, many TVchannels, ...). Our GPS found the house without a problem and we haven't met a mosquito (our stay was in april). We recommend this house to everyone! Dear Lieselot and Ken. Thank you very much for your kind words. We really enjoyed meeting you and to know you had a happy holidays in our house. You are a very beautiful family with 2 lovely daughters. It was very nice to receive you at our house. At the end of the vacation, the house was as beautiful and clean as when we received you. We would like to see you again and hear from you. Congratulations to you and to your two beautiful princesses. Very green and quiet landscape with beautiful beaches.